I have to admit to something. Something I’ve been neglecting for far too long. Something… gross. My dishcloths have officially turned into dishrags, in the worst possible way. It’s real grim in my towel-and-rag drawer. I didn’t think it was that bad, but now that I’m thinking about it, most of my “nice” dishcloths were wedding presents. We got married 9 years ago. I thought about posting a picture of the old rags, but I decided against it for 2 reasons. You really don’t want to see them. I don’t want you to judge me. Because… oof. They’re real grim. The nicest ones are “only” bleached out from years of washing. The worst are stained with curry or chocolate (or who knows what) and riddled with holes from being used so many times. So, in a fit of practicality (and avoidance of the projects I’m “supposed” to be doing), I’m breaking out my bin o’ dishcloth cotton. 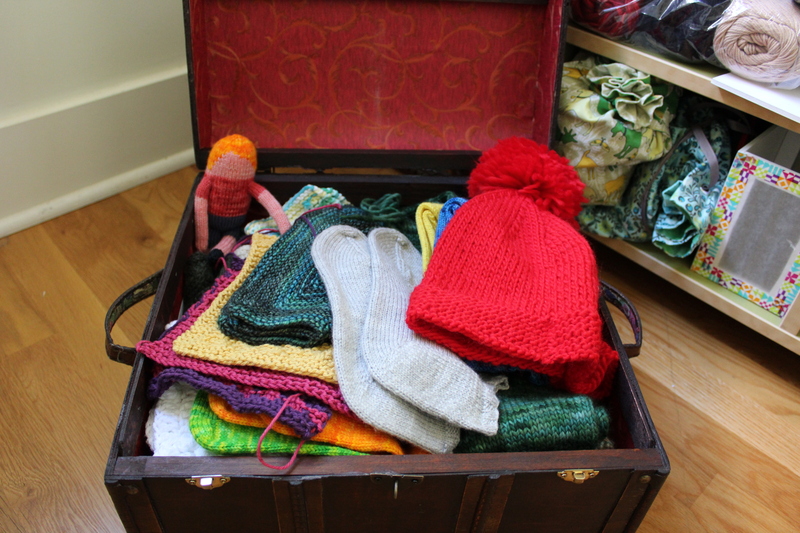 There’s plenty of yarn in there, but none of the colors are terribly cohesive, and there isn’t a ton of any one brand. I’ve always had grand plans of working up a lovely set of fancy matching dishcloths and towels, but… clearly that hasn’t happened. So instead, I’m grabbing colors at random and making big ol’ single-crochet squares until the yarn runs out, then switching to the next color. They might not be the fanciest dishcloths, or terribly interesting to work up, but they’ll do their jobs well enough, and I’m enjoying burning through my stash yarn. We’ll just have to see how many I make it through before I get bored- so far two and a half, and I’m still going strong. Have you worked on any really practical projects lately? 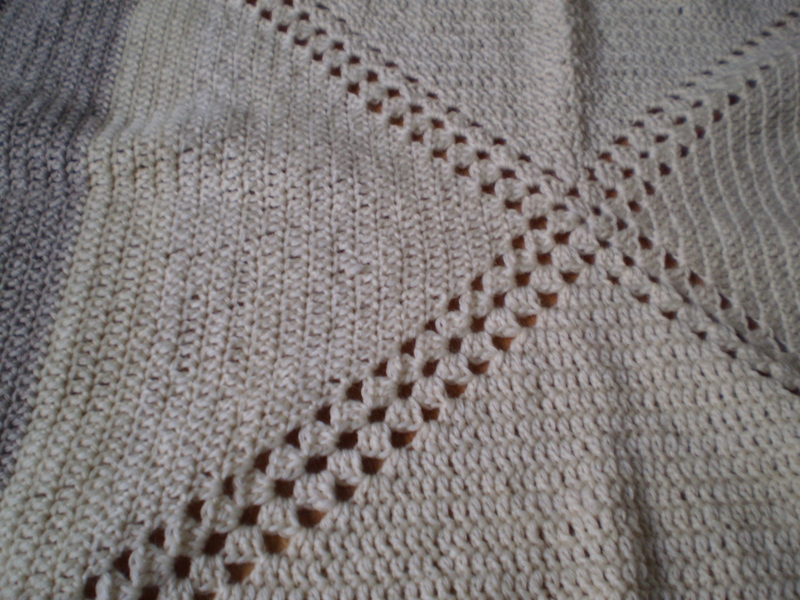 This entry was posted in On My Needles and tagged crochet, dishcloth, dishrag, single crochet, stash, stashbusting, stashbuter on March 11, 2019 by onemilljellybeans. I’m not doing anything as formalized as New Years Resolutions this year, but I do have some vague goals I’m going to try to follow this year. I’m going to try finishing up some WIPs that have been sitting around my office for too long, I’m going to try learning some new techniques, and I’m going to use up more of my stash. Me and every other knitter. But, I suppose it can’t hurt to give it a go. 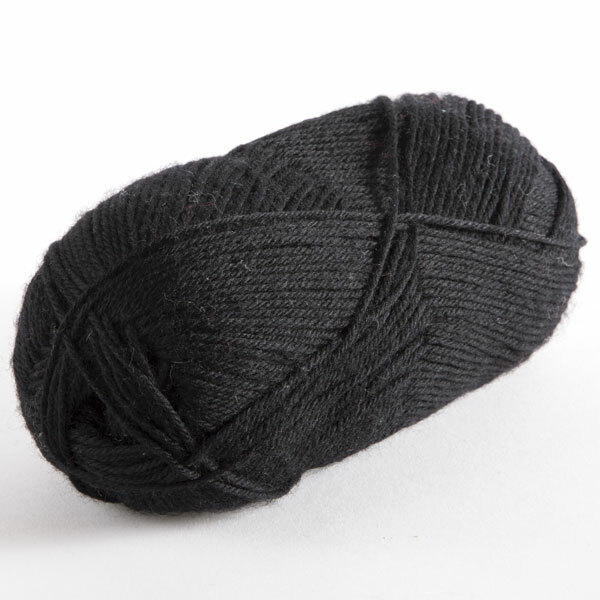 But I did find a couple half-skeins of Knit Picks Stroll in Black and an almost-full ball of Firecracker Heather. And you know what’s tomato red and black, right? 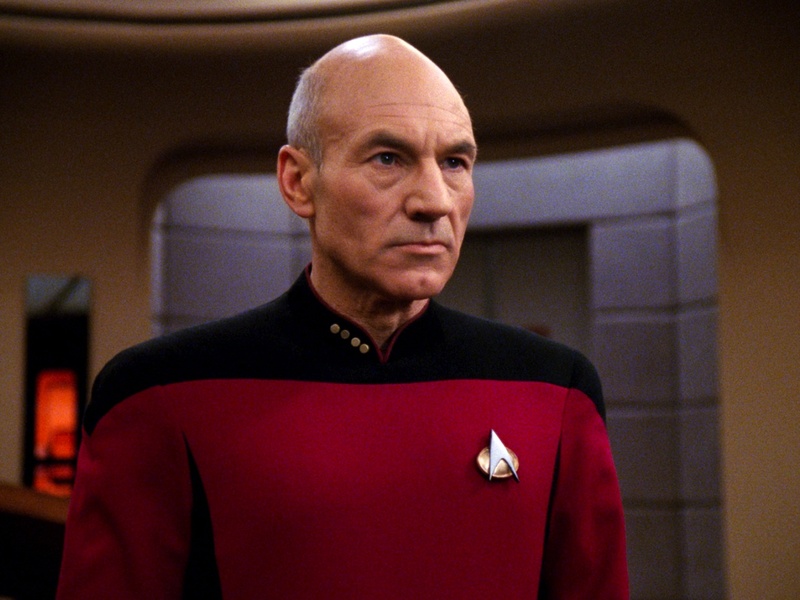 It’s Captain Picard’s uniform! 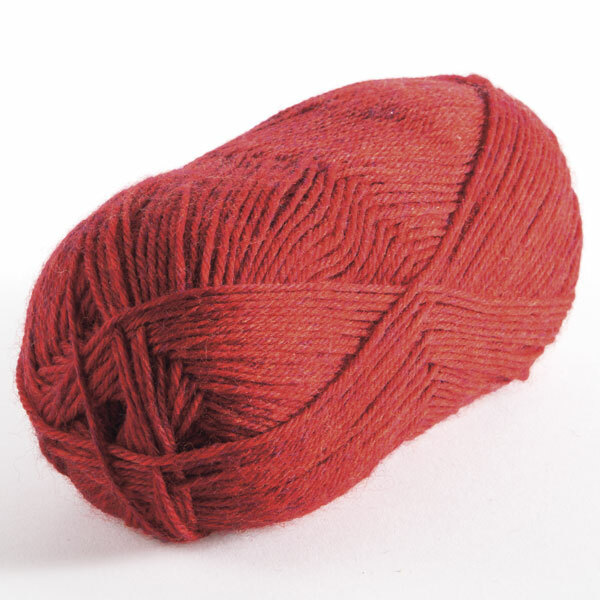 The red yarn was almost perfectly the right color of “Command Red”! 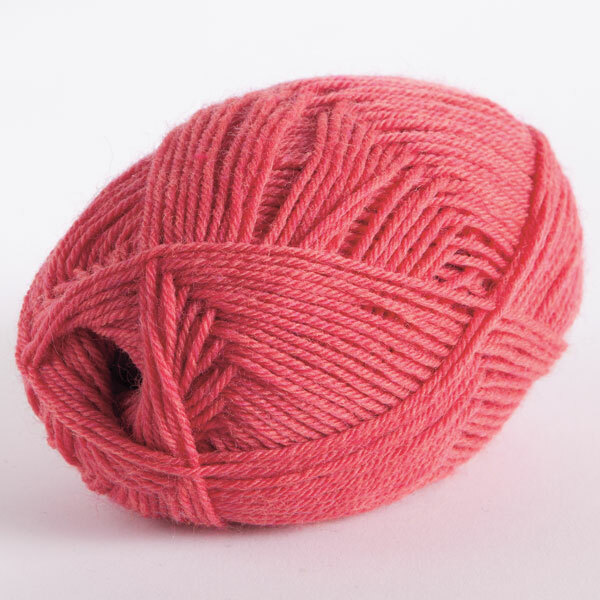 Now I just have to decide- is this yarn going to be a pair of Command Red socks, or maybe a Command Red hat, or maybe even a tiny Command Red sweater for a baby nerd? Choices, choices. Have you dug through your stash lately? Find anything good? This entry was posted in On My Needles and tagged black, command red, knitting, red, star trek, stash, stash busting, stashbusting on January 19, 2018 by onemilljellybeans. I’m going to let you in on a secret! 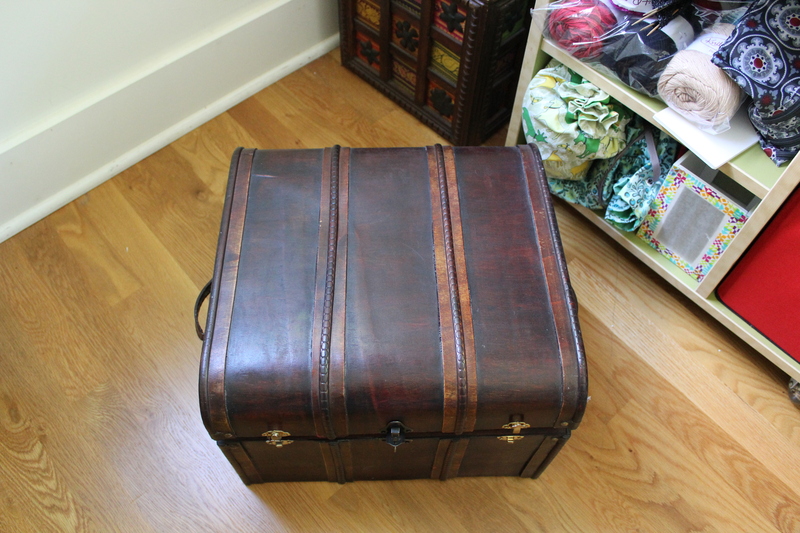 In the corner of my studio, behind a small bookshelf (that is currently holding a half-dozen half finished projects instead of books), there is a small wooden chest. If you pull that chest out, and open it up, you’ll find something amazing. All the homeless projects I’ve made over the years! I’ve got prototypes, and one-off projects. Socks that turned out too small or to big. Hats that are too warm for Seattle. 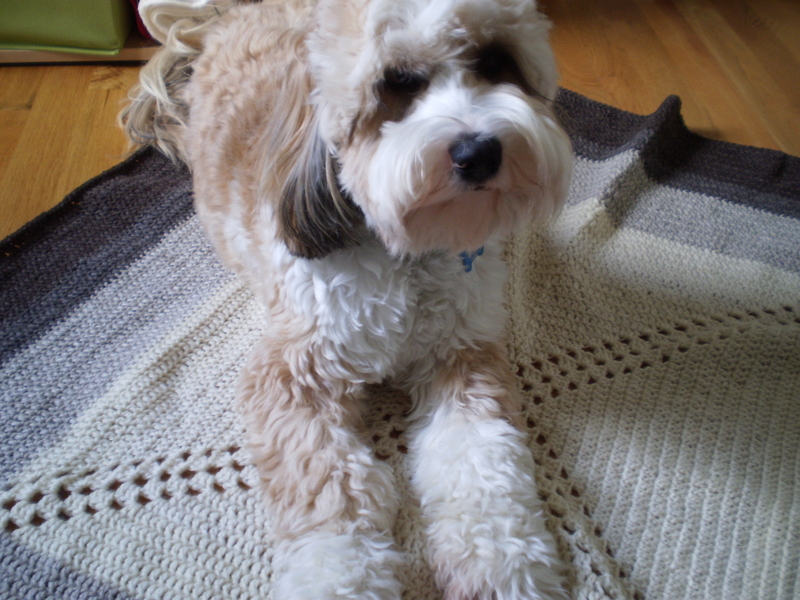 I’ve got scarves that I really wanted to knit, but don’t really want to wear and more dishcloths than I could ever use. I don’t usually think about what I’ve got stashed in my secret chest, but it is satisfying to open it up from time to time to see the result of all my hard work. 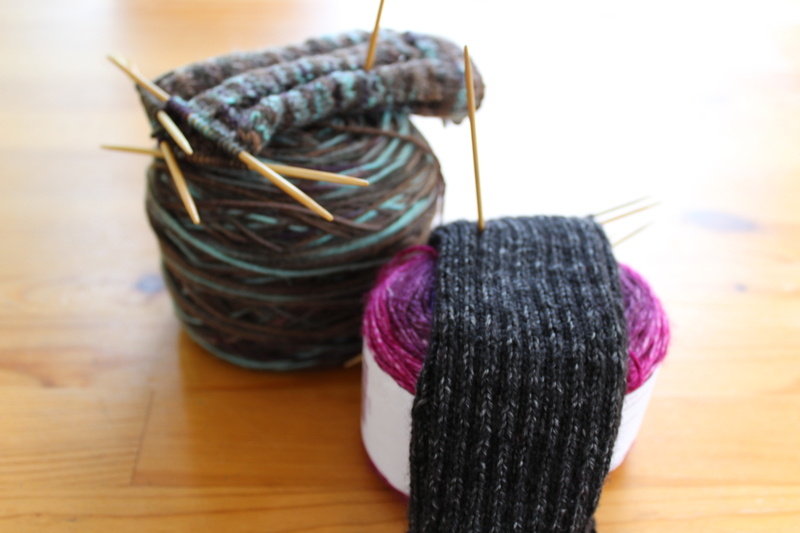 And, it’s particularly handy when I get invited to a baby shower/birthday party/whatever at the last minute- I can pull out a pair of socks I knit in 2012 and look like I did a heck of a lot more planning than I really did. 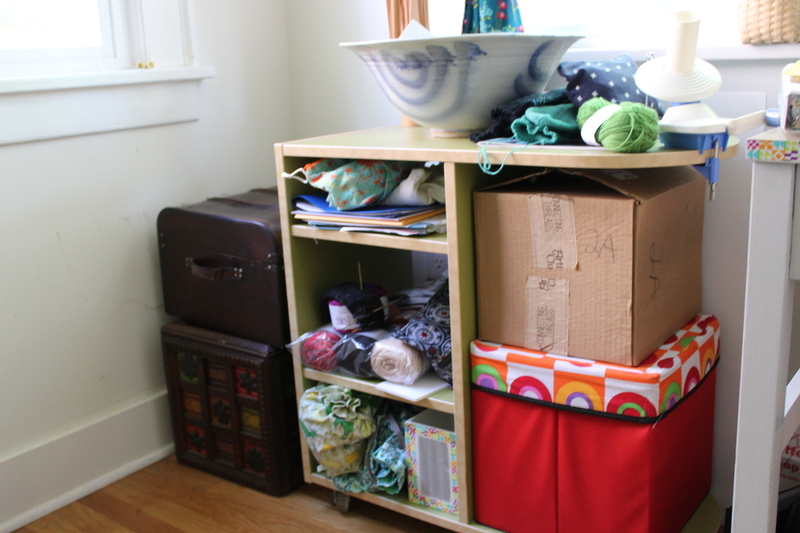 Do you have a finished object stash? Or, is this a symptom of my hoarding tendencies? This entry was posted in FYI and tagged chest, finised object, finished objects, fo, stash on July 21, 2017 by onemilljellybeans. I feel like I’ve been talking about using up leftovers a lot lately. I suppose, I have been trying to use up my stash before I go buy more (I’m almost out of space in my yarn bins). And this week isn’t any different. Over the years I’ve collected a bunch of Lion Brand Fisherman’s Wool in a selection of natural heathered colors from off-white to dark, chocolate brown. I’ve used this yarn in a bunch of projects- mostly blankets, and no matter how carefully I plan, I always end up with a bunch of half-skeins leftover. I even had several half-skeins of the same colors, but different dye lots. I had to figure out what to make with this ragtag bunch of yarn. Anything fancy, like a sweater, was out because of the weird amounts of each color yarn. Anything that took a lot of planning was out, too- I wasn’t in the mood to do a lot of math on this one. So, I arranged the yarn in a gradient from lightest to darkest, dug out my crochet hooks and just started making a granny square. 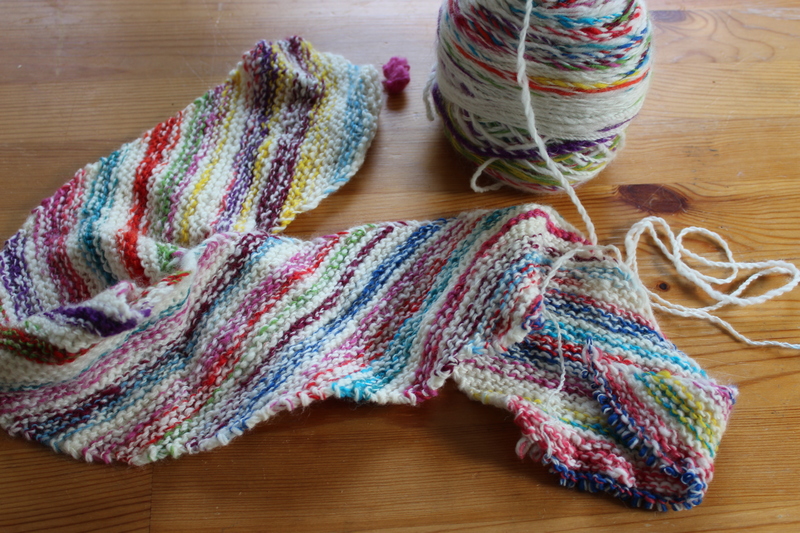 And kept on going- using up one skein after another. 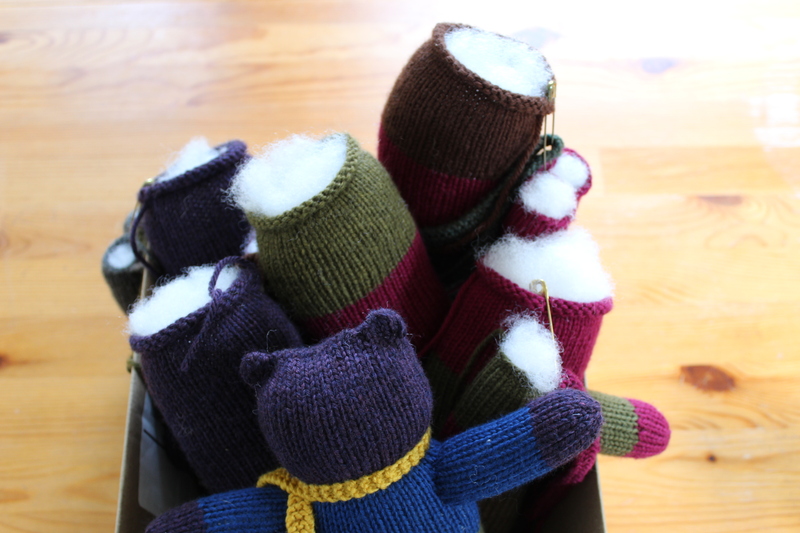 (The little bits leftover are going to turn into another Mother Bear– I think I have a problem.) 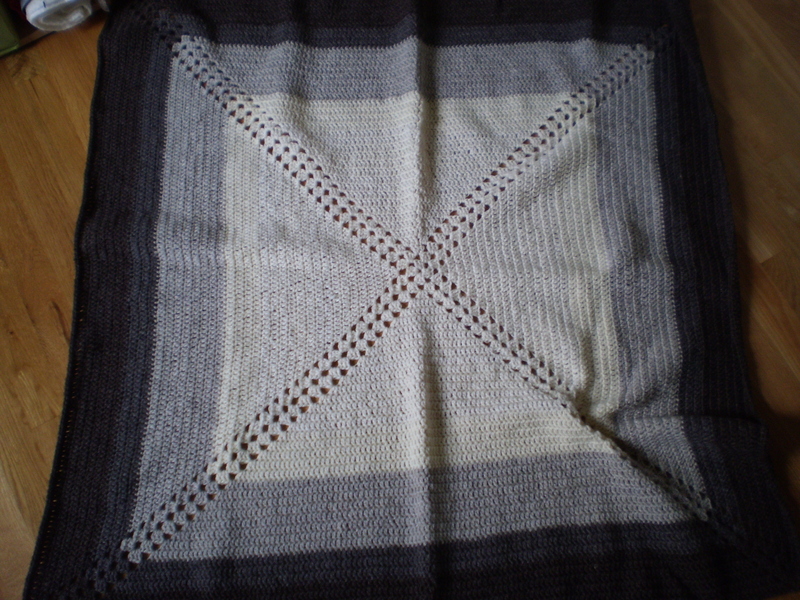 The blanket ended up about 4 feet by 4 feet- a nice size for a lap blanket or maybe a baby blanket (though I don’t know if I’d give a baby an itchy wool, non-washable blanket). 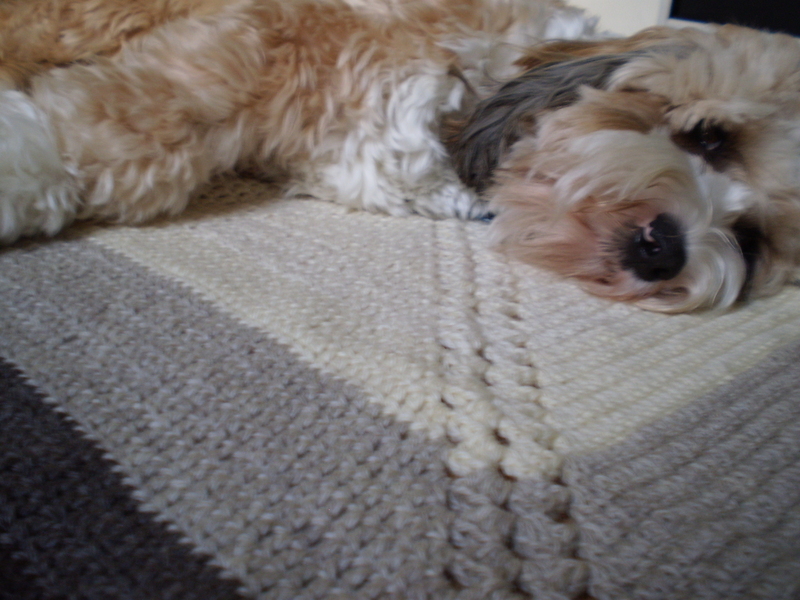 Ollie seems to like it. He saw me taking pictures and came over to give it the official “Dog Seal of Approval.” And then he fell asleep- because he leads a very high-energy, stressful life. 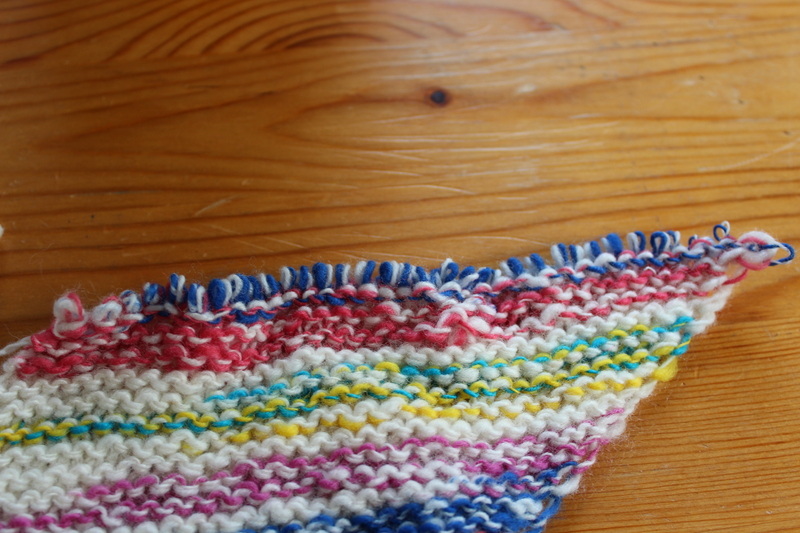 What have you been doing to use up your leftover skeins of yarn? This entry was posted in On My Needles and tagged afghan, blanket, crochet, fisherman's wool, scraps, stash, wool on February 1, 2016 by onemilljellybeans.